Eating is the most common and direct ethical action; every meal, every snack and every beverage you consume is an active decision. Implied in these decisions are choices about where your food comes from, who makes it, how it is made, and how it is distributed so that it makes its way to your plate. In practical terms, these decisions have economic, political, social, environmental, dietary and health implications, and each of those factors connects directly to your values, or in some cases belies them. I think that you are committed to an ethical imperative to “eat your values”. First, it is a description of what you already do: the decisions that you make about what you eat describe your own beliefs about what kinds of things are good and bad, right and wrong. The description about your choices of what to eat and drink raises an ethical question about your commitment to the imperative to “eat your values”: do you identify with those choices? Do they convey your deeply held beliefs about good and bad, right and wrong? Are your choices consistent with what you take to be your own beliefs and values? The second way you are committed to an ethical imperative to “eat your values” is as a normative commitment. That is, you believe that you ought to view your choices about what to eat and drink as directly connected to your values, and indeed that you think others ought to do this as well. If this is true, then you also require a certain level of thoughtfulness and reflection of yourself and others: thoughtfulness about what your values are and how they relate to the production and consumption of food and drink. The normative view offers an argument and claim about right and wrong, and a basis for judging which values we ought to have and how they should shape our choices and actions. This understanding of values allows us to begin to evaluate what it means to say that “We Are What We Eat”, and to consider whether you ought to “Eat Your Values”. We might think, for example, that this is a dietary statement. That is, we are what we eat in physical terms—that what we eat in turn contributes vital nutrients, proteins, fats and sugars that end up constituting our bodies. If this is a dietary statement, what do your choices about what to eat show your values to be? Do you eat in a way that values health and longevity for your body or do you consume foods that you know to be unhealthy? Do you prefer convenience and ease over quality and care in the preparation of food? We might also think of the saying “We Are What We Eat” as a political statement. Our food and drink choices play an essential role in determining the landscape of the United States. They determine which businesses succeed and which fail; they determine the winners and losers in the food market. The winners shape the policies that regulate and influence how food reaches the consumer. You vote at least three times every day on those food policies, and determine the food landscape of the United States. What policies are you supporting? Would you like to know whether your food has been genetically modified (GMO), or do you trust multinational corporations to tell you what you need to know? Food connects us to deeply held traditions, beliefs and values. 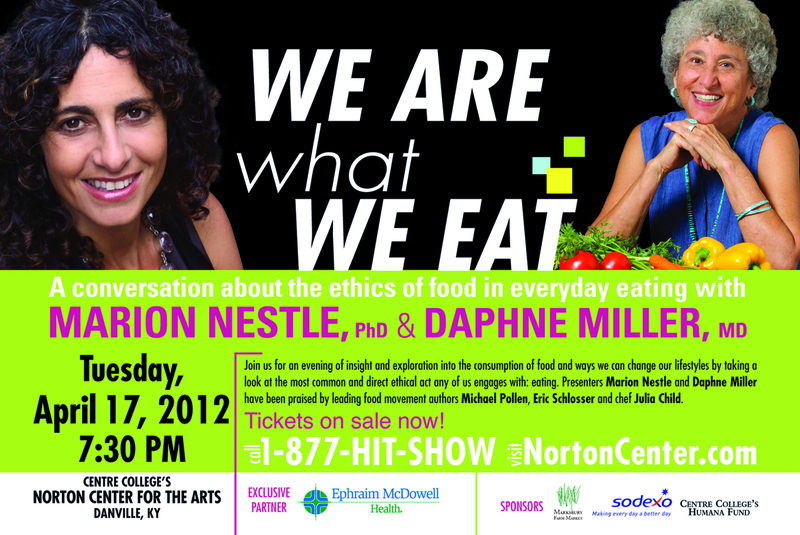 The notion that “We Are What We Eat” ought to make us consider what kinds of values we are eating. Do they represent the values you hold most deeply? Can you accept the imperative to “Eat Your Values” and view eating as a way to act on your values so that you show them to be the foundation of your identity? Kirchner came to Centre in 2009 as a Visiting Lecturer of Philosophy and began as Assistant Professor of Philosophy in 2010. Prior to completing his Ph.D. in philosophy at Indiana University in 2010, he received a B.A. in international relations and German at the Johns Hopkins University, and completed a Masters of Theological Studies at Harvard University. Kirchner specializes in ethics and 19th-century philosophy, and on Hegel’s use of ancient views of the self in his ethics in particular. He teaches a range of courses including humanities, philosophy of religion, introduction to ethics, biomedical ethics, ethical theory, 19th-century philosophy, and the ethics of food. Kirchner recently published a paper entitled “Augustine’s Use of Epicureanism: Three Paradigmatic Problems for a Theory of Friendship in the Confessions” in International Philosophical Quarterly (June 2010) and is currently researching and teaching food ethics, and writing a book entitled Eat Your Values: The Ethics of Food.